In August the American Academy of Family Physicians an association for primary care physicians released a one page policy statement saying Nurse Practitioners and Physician assistants are not entering the workforce fast enough to meet the shortage of primary care or family physicians. 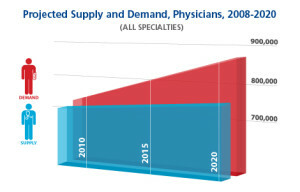 I found this policy statement fascinating because it says something many people outside the world of healthcare may not know or believe, there is a serious primary care physician shortage in this country and that shortage is getting worse. Primary care physicians are considered everything from family physicians to internists, pediatricians, and even OB/GYN’s. It is expected to continue to get worse after the full implementation of the Affordable Care Act. What is exacerbating the problem, according to the AAFP, is that only about 45% of family physicians and 51% of internists are accepting new patients. Not only is there an admitted shortage of doctors but of the doctors that are working only about half are taking new patients. You shouldn’t think that new doctors will fill the void because according to the AAFP only 2-6% of new internists are choosing primary care and 50% of pediatricians are getting into primary care. The vast majority of new doctors are going into sub-specialty care such as pediatric neurology to name one of the many that exists. The why is easy to understand, it’s all about the money. Doctors in sub-specialties make 3 to 5 times more money per hour than doctors in primary care. 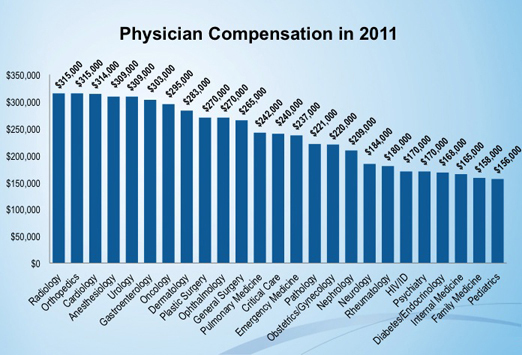 With student loan debt t in the mid to high 6 figures is easy to understand why a new doctor would go into radiology where pay can be 4 times higher than primary care. Could you imaging getting done with college and having around $300,000 in school debt. I had $120,000 in student loan debt when I finished chiropractic college and that gave me nightmares, I couldn’t imagine what I would do with 3 times that debt. The statement by the AAFP focused on the low number of PA’s and NP’s entering primary care because it was thought that these practitioners could ease the shortage of doctors in primary care. NP’s and PA’s can do similar things as doctors but are not given complete autonomy over patient care. They have diagnosing and prescription privileges but their decisions are subject to the review and oversight of doctors. Many of us are familiar with NP’s and/or PA’s because they are now all over helping out and in some cases filling in for our doctors when they are busy or out of town. The problem as the AAFP points out is they, too , are not entering primary care as doctors are more than likely because the money is better in sub-specialties than it is in primary care. So the shortage of primary care doctors continues to worsen. What is the answer? According to the AAFP, the answer is to legislate insurance reimbursement for primary care to increase which I think is ridiculous. I believe the answer is in educating Americans in how to take care of themselves. If we can take care of ourselves better, we will be more healthy and not require healthcare services as much as we’ve had to in the past. Chiropractors have been educating our patients for the past 118 years so we are already doing this. My answer is to promote chiropractic care for all Americans like dentistry was promoted in the 60’s. Promote chiropractic, because we have the knowledge and time to help teach our fellow Americans to live healthier lives.